Staying at the turtle camp was a once in a lifetime experience I will never forget! From waking up to the sound of the waves crashing on the beach every morning; to seeing the sun set over the ocean every evening, every second spent there was incredible. When I first arrived in Mexico, it was late in the evening but I couldn’t wait to explore. I was greeted in the airport with a massive smile from Roccio and taken to her welcoming family home where I spent the night. The next morning I got on the bus and made my way to the turtle camp in Tecoman. The views from the bus window were breath taking, and only a taste of what was to come. Campemento Tecoman, or the Turtle camp, as it’s known, was stunning. It was so simple yet homely. I was shown round the camp and then Oliver explained about the duties we had as volunteers. Every day we would dig nests in the hatcheries for eggs that had been collected off the main beach, and sometimes even go on patrol (on a quad bike) in the middle of the night with the biologists. Also we visited a crocodile farm once a week to help out with conservation tasks there. I chose to do my university dissertation in Mexico with Projects Abroad. I was looking at the effect that artificial hatcheries had on baby hatchlings compared to that of nests left in natural conditions. All the staff at the camp were extremely helpful with my data collection and even allowed me to use specialist equipment to measure nest temperature. I couldn’t have asked for anything better and now have substantial data to base my 10,000 word project on. At the weekends, we were allowed to leave camp and travel around Mexico. I saw some fantastic places including the cities of Colima, Melaque and Manzanillo. I got the chance to see many fantastic landscapes including bulging waterfalls and glorious white sandy beaches, while experiencing the culture of Mexico. Memories that are never forgotten! 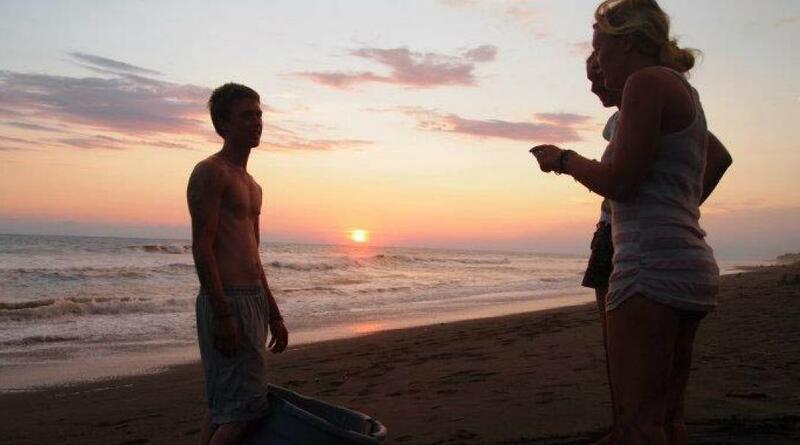 My fondest memory of Mexico and turtle camp was on one of my final nights. Over 10 nests had hatched that evening and the sun was just setting, producing a striking pink/red sunset as we released the hatchlings into the sea. Everyone came together for that moment and it was at that point that reality hit, and I would have to go home soon. It was hard to leave such an amazing place, and amazing friends, and if I could I would have stayed longer, but home commitments dragged me back. I have tried my best to describe my Mexico experience; however, I don’t think words can sum it up. I have gained memories I will never forget, friends from all over the world and experience in the conservation field (something that I want my future career to be in).